Gold Coast Ship Terminal Information Summary – Gold Coast City Council. Final Report, December 2012. The elements discussed in this critical analysis refer principally to AEC's focus on the proposed Cruise Ship Terminal component and associated commercial developments contained in a concept commonly referred to by the current Queensland State Government and Gold Coast City Council (GCCC) as the 'Broadwater Marine Project'. This project is in the process of being studied for its potential to be located on the Broadwater and Southport Spit, Gold Coast, Queensland. A significant overstatement by AEC of revenue projections from a Gold Coast Cruise Ship Terminal (GCCST). Project infrastructure costs, including capital dredging and ongoing operational and maintenance costs, significantly under costed by AEC. A detailed Environmental Impact Study was not costed by AEC in their 'Business Case' nor any reference made to the impact of the Australian Government's Environment Protection and Biodiversity Conservation Act (EPBC Act) and associated 'Protected Matter' findings. No costing by AEC of environmental mitigation works to protect or replace threatened marine and wildlife species and habitat; or to protect wetlands of international significance or whales and other cetaceans. 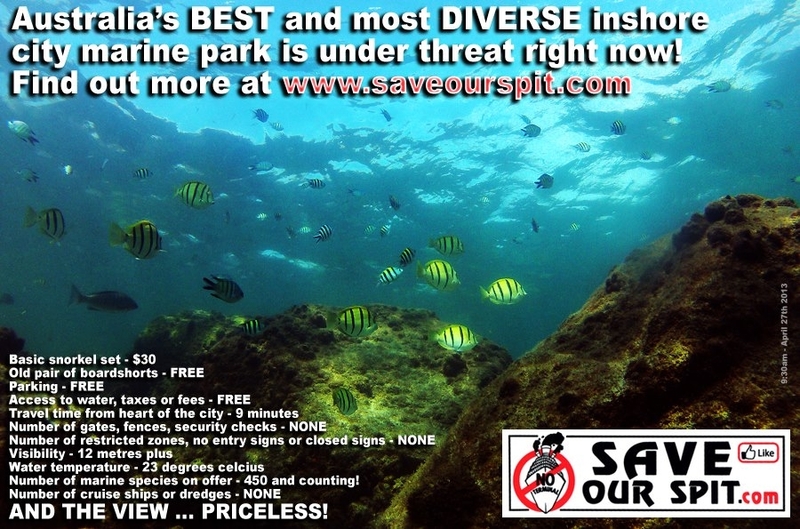 No consultation by AEC with existing tourism industries (fishing, boating, surfing, diving, whale-watching, sea-kayaking etc); or community groups and recreational users. No reference to the potential threat to current tourism and recreational revenue derived from dive, surf, boating, fishing and whale-watching etc industries in comparison to the small proportion of revenue predicted by AEC from a GCCST. No costing by AEC towards compensation for the potential negation and/or loss of existing tourism and recreational activities. No ongoing fulltime, part-time or casual jobs directly related to Gold Coast tourism were identified or quantified by AEC in relation to the operations of a GCCST. No mention or costing of potential damage in relation to the Gold Coast Seaway walls and private property revetment walls throughout the Nerang-Coomera River system and increased insurance premiums as a result of dredging for a GCCST. AEC admit potential damage to Seaway walls from the use of modern ship thrusters. No reference to two official GCCC surveys conducted in 2012 which revealed that the majority of Gold Coast residents opposed a GCCST and associated commercial developments on public open space on The Spit and Broadwater (online survey: 96% opposed; telephone survey with 'invite only' participants: 76% opposed). AEC admit a GCCST will require totally uncompetitive port and passenger charges (5-6 times more than the current market to 'break even') in comparison to existing Australian ports. AEC ignore significant competition from a nearby established and expanding Brisbane port. AEC rely on the discredited and inaccurate Meridian Maritime Services (2012) and Star Cruise Ship (2005) navigational simulation reports as the basis for their 'Business Case'. 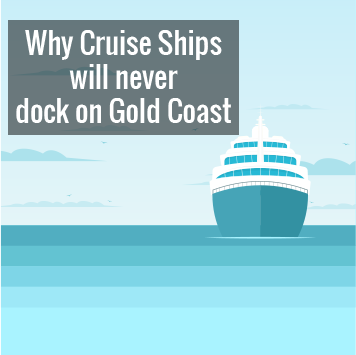 By 2020, the cruise vessels in the fleets of the world's major cruise line companies will be too large to ever safely dock at a GCCST under any weather or channel conditions. AEC Ignore significant meteorological conditions which will prohibit the safe navigation and docking of current and future cruise vessels in a massively dredged Broadwater during the main six month cruise season (Oct-March). Very poor value add generated by a GCCST – adds only 0.5% to direct Gold Coast revenue and tourism jobs based on AEC projected cruise ship visit numbers which are heavily overstated. AEC admit, 'The GCCST is not commercially viable as a stand-alone investment opportunity'. GCCST not commercially viable as an ongoing operation even in conjunction with the lease/sale/giveaway of up to 75 hectares of public recreational land and waterways to the private development industry. No ethical business case presented by AEC for the lease/sale/giveaway of large tracts of public open space and waterways. No reference made by AEC to Public Private Partnerships (PPP) and its 'value for money' infrastructure; 'Project Framework Assurance' requirements; or the 'identification of risks' under current 'PPP' State Legislation. No reference or costing by AEC regarding the impacts of constructing a GCCST and associated commercial developments in relation to Federal, State and Local Government Legislation, Environmental and Planning Laws or the recently introduced Australian Maritime Legislation (2012) pertaining to 'safety and environment'.